Nomura NN-16KFC 16mm CNC Screw Machine s/n 34058602 w/ Mitsubishi Meldas Controls, (4) Cross Slide Tooling, )4) Live Cross Drilling Tooling, (4) Front Drilling Stations, Parts Catcher, Bar Feed, Coolant. 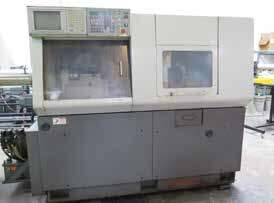 Nomura NN-12K 12mm CNC Screw Machine s/n 29048502 w/ Mitsubishi Meldas Controls, (6) Cross Slide Tooling, (3) Drilling Stations, Parts Catcher, Bar Feed, Coolant. Nomura NN-12K 12mm CNC Screw Machine s/n 29028507 w/ Mitsubishi Meldas Controls, (6) Cross Slide Tooling, (3) Drilling Stations, Bar Feed, Coolant. Nomura NN-12K 12mm CNC Screw Machine s/n 29018604 w/ Mitsubishi Meldas Controls, (6) Cross Slide Tooling, (3) Drilling Stations, Parts Catcher, Bar Feed, Coolant. 1996 Daewoo PUMA 6G CNC Cross Slide Turning Center s/n PM6G0238 w/ Mitsubishi Controls, Parts Catcher, 6” 3-Jaw Power Chuck, 16C Collet Nose, Coolant, CNC Enhancements “Hydroturn” 6-Tube Hydraulic Bar Feed. Takisawa EX-108 CNC Turning Center w/ Fanuc Series 21i-T Controls, 12-Station Turret, Hydraulic Tailstock, Parts Catcher, 8” 3-Jaw Power Chuck, 3J Collet Nose, Coolant, LNS Hydrobar 5-Tube Hydraulic Bar Feed. Hardinge / Omni Turn CNC Cross Slide Lathe s/n AHC-704 w/ Omni Turn 0T-CNC Controls, “C” Axis with High Speed Pneumatic Tooling, Pneumatic 5C Collet Closer, Coolant, Hardinge Retractable Bar Feed. Leadwell “Drillmaster” CNC Vertical Machining Center s/n 88019 w/ Mitsubishi Meldas Mo Controls, 16-Station ATC, BT-40 Taper Spindle, 6000 RPM, 13 ½” x 28 ½” Table, Coolant. Clark Vertical Mill s/n US32A w/ Contour SDS2MS DRO, 3Hp Motor, 60-4200 Dial Change RPM, Chrome Ways, Power Feed, 9” x 49” Table. Tornos Type M7 Automatic Screw Machine s/n 95322 w/ Spindle Stop, Live Milling, (5) Cross Slides, (3)Drilling Stations, Bar Feed, Coolant. Tornos Type M7 Automatic Screw Machine s/n 75794 w/ Spindle Stop, Live Milling, (5) Cross Slides, (3)Drilling Stations, Bar Feed, Coolant. Kitamura mdl. K-5 Second OP Lathe w/ 3-Speeds, Cross Slide. Star mdl. S-178 Precision Tool Grinder s/n 810003. Accu-Finish Series II Tool Lapper/Grinder. Ingersoll Rand 10Hp Vertical Air Compressor s/n 0303280009 w/ 2-Stage Pump, 120 Gallon Tank.